For paramedics and emergency medical technicians, patient assessments are the key to everything. Practicing these life-saving skills around a classroom table is one thing. But it’s an entirely different matter when in the back of an ambulance. 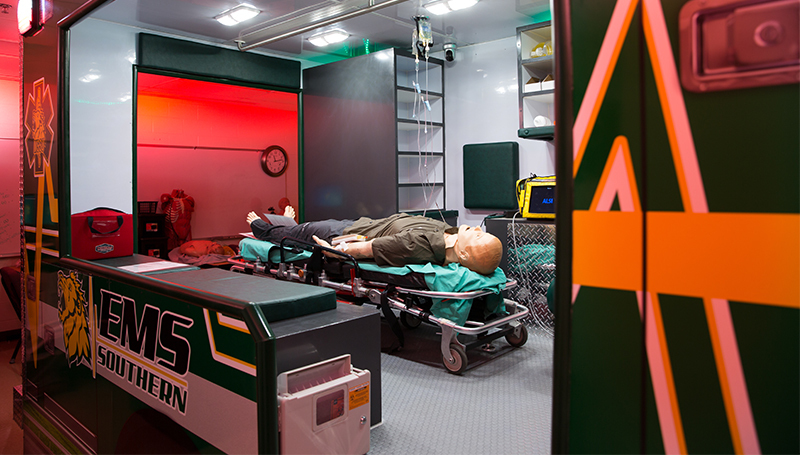 A custom-built pair of ambulance simulators will allow Missouri Southern students to become familiar with the constraints and challenges they’ll face in the real world. Located in Room 312 of the León Health Sciences Building, the pair of adjoining simulators were built by a Texas company over 23 days last fall. Constructed in the center of the room, the simulators sport both the university colors and EMS logo. Lee said the grant-funded simulators offer an amazing opportunity for students – especially in a larger class. Each simulator has four cameras, with video feeds allowing instructors or other students to watch what’s happening in real time. Lee said a program the department plans to purchase will offer interviews with patients in a medical facility, allowing students to know what the scenario will be before getting into the ambulance simulator. Partnering with other departments – such as nursing or respiratory therapy – will also allow students to practice moving their simulated patients to and from the back of the ambulance.